Duration: Please note that you can extend for any length of time (min 1 Month). Dates: This project can be joined at any time of the year and any day of the week. Introduction: A programme suitable for persons of all ages looking for that something different as part of a gap year or following a life change. This is your chance to contribute to conservation, to make a difference and to return to nature. Location: The Project is located between Port Elizabeth and Grahamstown South Africa. Volunteers must arrange their flights to and from Port Elizabeth airport. 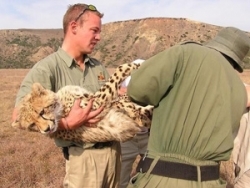 Project: This Game Reserve offers a programme suitable for persons of all ages looking for that something different as part of a gap year or following a life change. This is your chance to contribute to conservation, to make a difference and to return to nature. Accommodation: Accommodation is in the newly renovated Old Railway Station in Paterson. It is very comfortable with DSTV, internet facility and an out door "braai" area. Laundry service is offered and the rooms are serviced daily. The festive pub next door is a popular gathering place for locals and students. Meals are prepared by the Safari Lodge staff. Program: Exciting and interesting things frequently happen on a game reserve and these dynamics will as far as possible be included in the programme. Briefing on the day's activities at 8.00 am. Pick up packed lunch at the Safari Lodge between 8.00 and 9.00 am. Move through to the game reserve to an allocated area to do vegetation management, on the way also tracking predators with telemetry. Lunch from around 1.00 to 2.00 pm next to the Bushman's River. Canoeing on the river until 3.00 pm. Animal monitoring in the afternoon. Program may include: Game drives (animal identification and tracking), game capture, birding orientation and classification, canoeing, boating, Xhosa culture, gardening, community service (at underprivileged schools or our Conservation Centre), history from Stone Age to more recent Frontier history, game management (culling, re-introducing, counts, bomas), land management (burning, grazing patterns, roads, water, fencing), veterinary work with our resident vet (darting and post-mortems), guided walks, medicinal use of plants, vegetation biomes: overnight camping and survival techniques, four star lodge experience, basic first aid, food preparation and wine tasting, emergency vehicle repairs, target shooting, anti-poaching control, crocodile centre, dairy farm, art workshop, pollution clean ups, Born Free Foundation, construction of bird hides and walking, trails, geology and paleontology, stargazing and basic astronomy, entomology collection, alien vegetation management. Excludes: All flights, all beverages, excursions, insurance, transfers. Applicants: Suitable for persons of all ages. Hours: Students are busy from Monday to Friday, the average working day being 8 hours. Weekends are free for students to either relax at their house or to go sightseeing. This listing has been viewed 17809 times.